Bentley Publishers congratulates author Bill Milliken on his induction into the Watkins Glen Legends of the Glen. Milliken, in addition to his illustrious automotive engineering career, is also renowned in the Watkins Glen, NY area for his instrumental work in laying the groundwork for the first race track in Watkins Glen, along with racing legend and close friend Cam Argetsinger. Now considered one of the pre-eminent race tracks in the United States, "The Glen" has come a long way since its establishment as a 6.6 mile road course for the inaugural Watkins Glen Grand Prix in 1948. It was during this race that Milliken captured the imagination of race fans and spectators by emerging uninjured from a rollover in his Bugatti 35A at what is now known affectionately as Milliken's Corner. Milliken joins motorsports legends Mario Andretti and Jeff Gordon in the 2011 Class of the Legends of the Glen. The honor was presented to Milliken at a ceremony in Watkins Glen on Friday, September 9 during festivities surrounding the annual Grand Prix Festival. Click below to read a press release from Multimatic on their take on Milliken's famous "camber car". 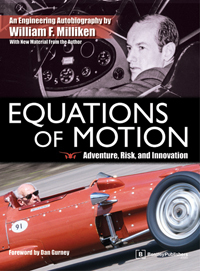 Bill's book Equations of Motion is available here, or wherever automotive books are sold.